While it’s been 70 degrees since at least March in Charlotte, it’s been cold in NYC! On one recent work day, I headed to meditation class and then took a long walk back in the cold before dinner. The brisk walk was so cool, I had soup on my mind for most of it. 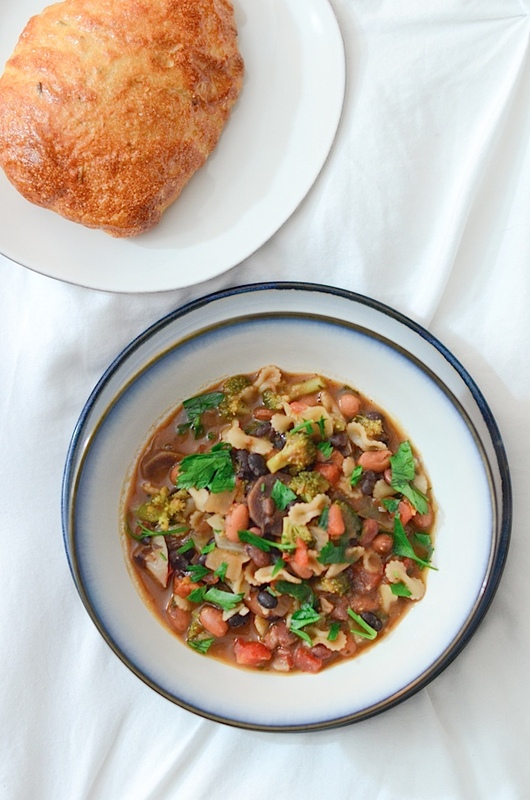 So, I whipped up this 3 Bean Italian Soup Recipe for a cozy dinner. It was super easy and made a ton of leftovers. Hope you guys like it if you try it! 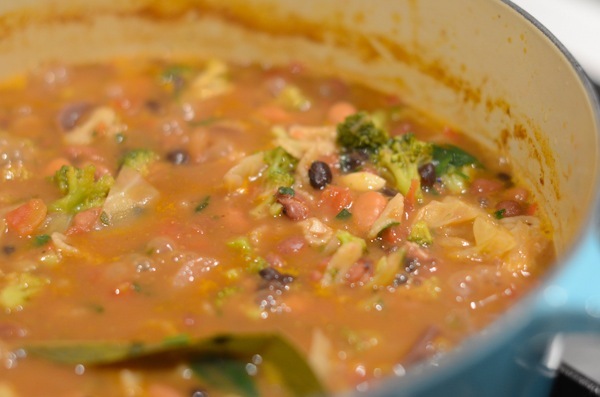 This is a great soup to make with pantry ingredients. Pretty much everything can be stored in the pantry or the freezer. And you could easily make substitutions with what you have on hand. Parsley is an optional garnish, but it makes the soup look so pretty! I love to serve it with a nice piece of focaccia. This is rosemary focaccia from a local bakery. I like to heat it up in the oven at around 350. Brush the bread with a little bit of extra virgin olive oil and sprinkle on a nice kosher salt. I’ll usually let it go for about 5 minutes, and it turns out lovely! This soup is actually pretty thick, and the pasta will continue to soak up the liquid. So, I like to add more vegetable broth when I re-heat the leftovers. If you don’t want to crack open a 4 cup box, I’ve seen 1-cup-sized boxes in the grocery store recently. I picked up a package to have on hand. 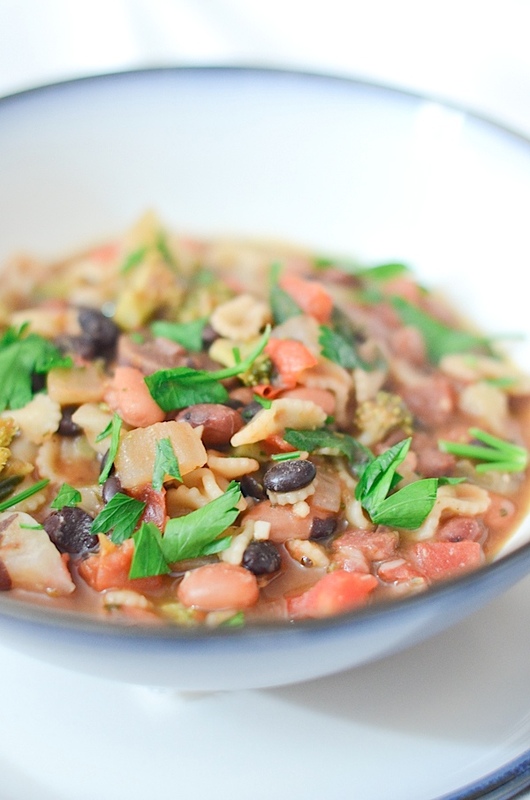 They’ve been perfect to add to the leftovers of this soup recipe so make it nice and brothy again. 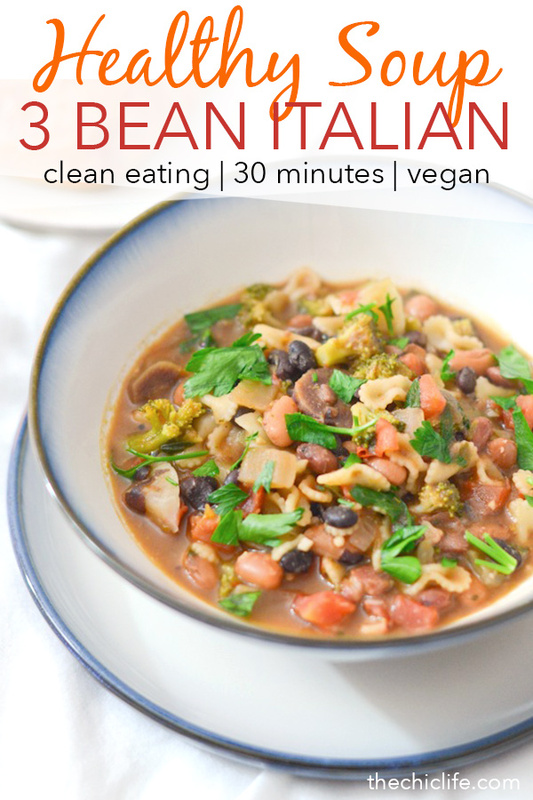 This recipe is easily made vegetarian / vegan by subbing water for the chicken broth and skipping the parmesan. I really only added the chicken broth because I had a cup leftover in a box in the fridge, and I didn’t want to it to go to waste. Into the soup it went! 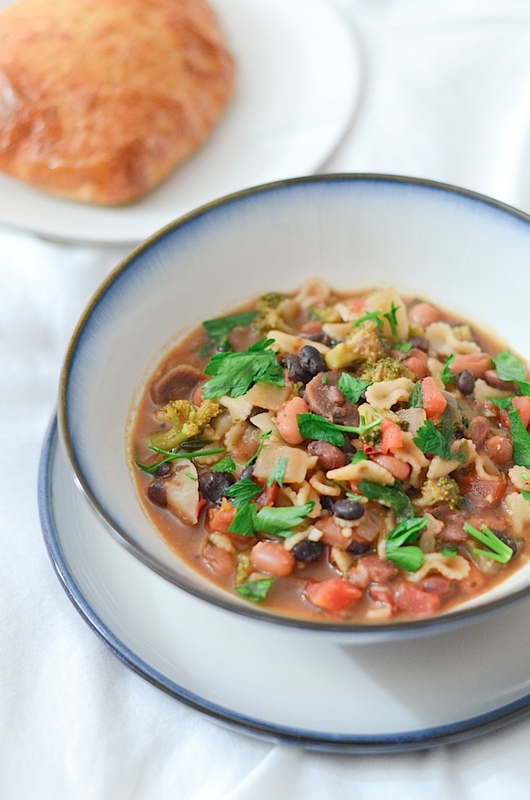 Cozy up with this easy, vegetarian 3 bean italian soup recipe. Sub vegetable broth or water for the chicken broth and skip the parmesan to make this vegan/vegetarian. 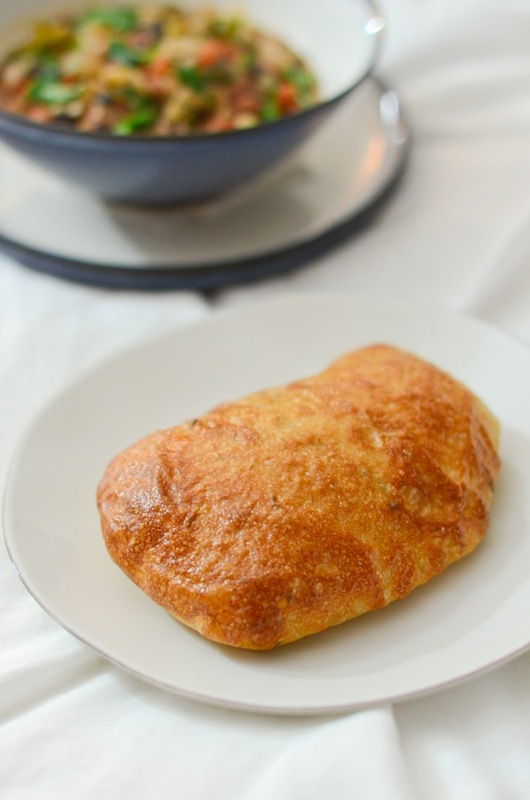 The parmesan adds a nice, salty flavor, so you may need to add more salt if you’re skipping it. Almost all of these ingredients are pantry/freezer safe, so you could get the ingredients now and make this the next time you don’t feel like going to the grocery store. Pre-heat oil in a large pot. Add onion and carrots and cook until translucent and lightly browned, about 5-7 minutes, stirring frequently. Stir in garlic and cook until fragrant, about 60 seconds. Add vegetable broth and chicken broth, scraping up any brown bits from the bottom of the pan (the brown bits add flavor!). Stir in bay leaves, Italian seasoning, salt, and pepper. Bring to a boil. Add beans, broccoli, tomatoes, pasta, and cabbage and bring back to boil and reduce to simmer. Cook until pasta is cooked and broccoli is tender, about 9 minutes, stirring occasionally. Stir in parsley. 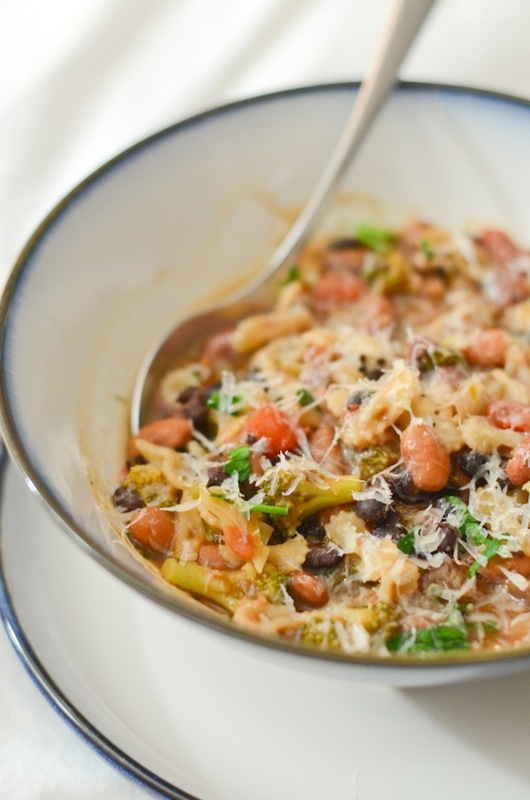 Serve in a bowl, top with additional parsley and fresh-grated parmesan, if using. Wait until safe to eat and enjoy!